Just four days remain until two of the world's most unpredictable leaders sit down at a historic summit. May 15 (11 a.m. EDT): North Korea suspends high-level inter-Korean talks. The North originally requested the meeting, but cancelled with less than 10 hours until the rendezvous. The North criticized the South for carrying out joint U.S.-South Korea military drill, Max Thunder. North’s state media called it a "North invasion uproar." May 15 (evening EDT): North Korea’s state media made a statement under Vice Foreign Minister Kim Kye Kwan’s name. It said the United States was pressuring North Korea to give up nuclear power from one side. The statement called National Security Adviser John Bolton "repugnant," due to his comparison of North Korea to Libya. May 22: U.S. Vice President Mike Pence warned North Korea in an interview with Fox News: "There was some talk about the Libyan model last week, and you know, as the president made clear, this will only end like the Libyan model ended if Kim Jong Un doesn't make a deal." May 24 (7:40 p.m. EDT): A statement made under name of Choi Son Hui, the vice foreign minister of North Korea, called Pence a "political dummy": "In case the U.S. offends against our goodwill and clings to unlawful and outrageous acts, I will put forward a suggestion to our supreme leadership for reconsidering the DPRK-U.S. summit." May 24: Trump calls off the planned summit with Kim Jong Un. In his official signed letter he says, "Based on the tremendous anger and open hostility displayed in your most recent statement, I feel it is inappropriate, at this time, to have this long-planned meeting." Trump left open a door for North Korea by saying chairman Kim Jong Un could contact him if he changes his mind on summit: "If you change your mind having to do with this most important summit, please do not hesitate to call me or write." 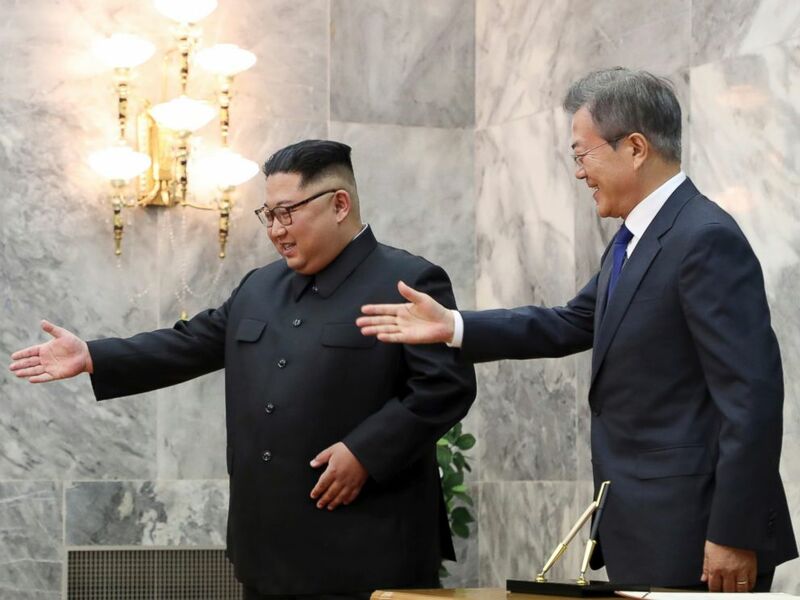 May 25 (Korean time): Kim Kye Kwan’s statement comes out in a calmer tone: "We would like to make known to the U.S. side once again that we have the intent to sit with the U.S. side to solve the problem regardless of ways at any time." May 25: Trump says, "If the U.S.-North Korea summit happens, it will be in Singapore on June 12." In this May 26, 2018 photo provided by South Korea Presidential Blue House via Yonhap News Agency, South Korean President Moon Jae-in, right, is guided by North Korean leader Kim Jong Un, left, at the northern side of Panmunjom in North Korea. May 26 (9 p.m. EDT): Moon made an announcement in front of press about his Saturday summit with Kim Jong Un, saying the meeting will "turn out fine." Meanwhile, in Washington, Trump told reporters, "We're looking at June 12 in Singapore. It hasn't changed." He said a team from the U.S. will travel to Singapore in case the summit happens. In Singapore, Deputy White House Chief of Staff Joe Hagin discussed logistics with North Korea's Kim Chang Son, North Korea's chief secretary of the Secretariat of the State Affairs Commission. 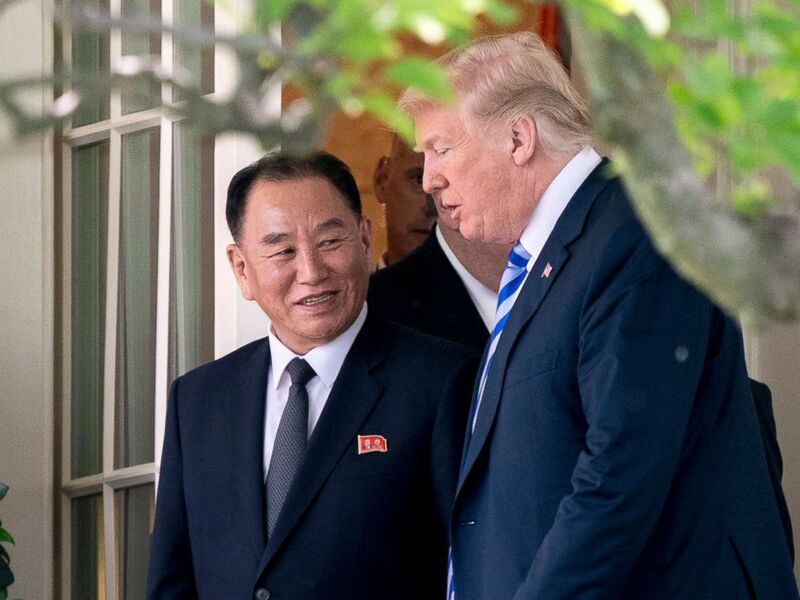 President Donald Trump talks with Kim Yong Chol, former North Korean military intelligence chief and one of leader Kim Jong Un's closest aides, as they walk from their meeting in the Oval Office of the White House in Washington, D.C., June 1, 2018. June 1: The story changed on Tuesday, when Trump said the meeting was back on: “We're meeting with the chairman on June 12 and I think it's probably going to be a very successful, ultimately a successful process.” This happened only a week after he called off the meeting with a letter. North Korean envoy Kim Yong Chol hand-delivered a letter from Kim Jong Un to Trump. For 90 minutes, the two discussed core issues at the White House. June 5: Singaporean Foreign Minister Vivian Balakrishnan met U.S. Secretary of State Mike Pompeo in Washington D.C. Balakrishnan was confident Singapore would serve as a neutral host. "It's in a sense of our contribution to world peace," he said. June 7: Singapore Foreign Minister Vivian Balakrishnan flew to Pyongyang for a two-day visit. Ri Yong Ho, president of the Supreme People's Assembly, greeted him.